The Sociabble employee advocacy platform enables companies to increase the effectiveness of their marketing activity. Simply done by aggregating content and inviting users to share it on their own social network accounts. In order to expand its product offer, Sociabble now integrates with the RadiumOne solution; which enables companies to target end users who engage with content that is shared via the platform elsewhere on the web. All companies can use RadiumOne’s PO.ST suite on all social networks to track the content generating the most engagement; as well as the audiences who interact with that content. The data collected provides companies with insights into the most engaged audiences; in order to retarget them through RTB (real-time bidding). Number of shares or click-backs, details per page, per piece of content, per social network, per location, shared carried out through copy/paste; these are just some examples of the data they collect. The integration of RadiumOne is particularly valuable for marketing and sales teams who can increase the number of touchpoints with target audiences. They do this by directly linking retargeting campaigns to Sociabble. They can also nurture them to transform them into leads. 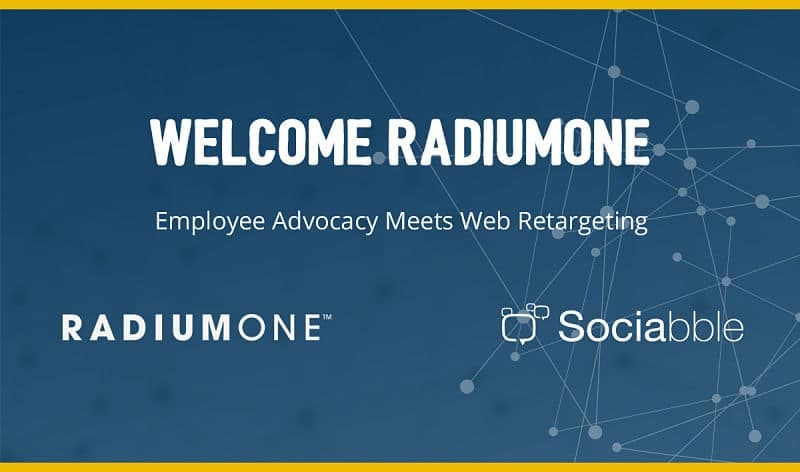 Thanks to the integration of RadiumOne, companies can also capitalize on the power of employee advocacy by re-engaging with the audiences that are reached by employees’ sharing activity.